The second or third time we did this punishing slog as kids, William Wilcock brought along an ‘unbreakable’ and capacious flask that his Dad had brought back from America. 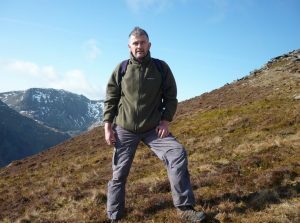 He put his rucksack down by said outcrop and it rolled away and bounced down 500 feet of mountainside, before coming to rest not far from the A5. He went to retrieve it and David Norris and I sat back and drank some tea from our winter-of-discontent-70s Woolworth Thermoses. It didn’t take William long. He was fit as a butcher’s dog. We expressed curiosity as to the state of his flask and he, with rucksack this time safely lodged, produced it with a certain confidence, for examination. Not a dent, not a scratch. He unscrewed the pristine cup and placed it in my hand. Removing the stopper, the steam spoke of a brew that had lost nothing of the heat it had carried when William’s mother had carefully filled the Transatlantic wonder. He poured the tea and it flowed into the ‘aloominum’ vessel with an odd, faint, tinkling whoosh. 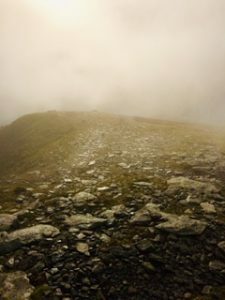 This was the sound of half a pint of tea supplemented by 32 spoonfuls of broken glass – crushed, splintered and granulated on its speedy descent of the West face. We poured some tea back into our unpretentious, eminently breakable flasks for later. Share and share alike. It’s a relentless grind until the gradient relents and you reach the sunlit uplands, the scent of which, experienced on a spring morning, will stay with you until the day you stare, ancient and leaning on your stick, at those heights, knowing that they were once yours. I can close my eyes now and stand on the upper flanks of Penyrolewen and watch a faint steam rising from the ground, as the spring sun climbs over the Glyderau and my nostrils fill with the essence of acid soil, scuffed rock and sweet heather. If you choose the softer option from the eastern end of my Taid’s favourite lake, following first the Afon Lloer, you will not stand in that place. 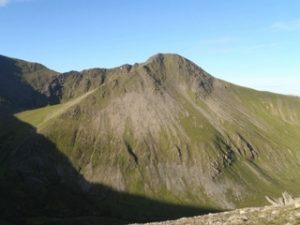 You will see it across the slopes to your left and instead, you will be compelled by Ffynon Lloer on your right and enjoy an easy gully-scramble before plodding the remainder of the east ridge. 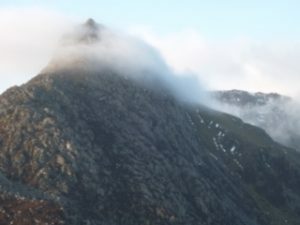 Tryfan will assume the most spectacular end-on shark’s fin profile but you will sacrifice the chance to hear the bees in the carpet above Carreg Bran. 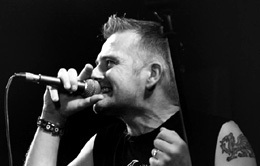 In the JUMP song ‘Valediction’ I wrote about about “where the crows wheel and call…” and in in my mind’s eye during every performance, that is where I stand. The true summit is a pile of stones above Cwm Lloer but there is also a shelter that overlooks Cwm Idwal. 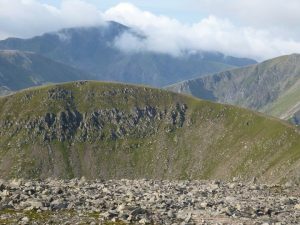 Whichever way you ascend, visit both before you continue, to my Bangor-mind at least, one of the finest walks anywhere. You’re not going to drop much below 3000 feet for quite a few miles. 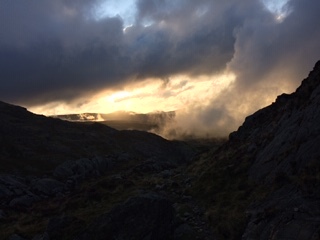 On your way to Carnedd Dafydd you cross Carnedd Fach and the sense of the Ancients will grip you. People made this lookout – thousands of years ago, they were up here, keeping watch. On a fine day you may be struck by the stark contrast between the sharp fall into the fresh clear water of Cwm Lloer and the long sweep to the Lafan Sands and the salt sea. On a wild day, I’ve climbed past the plane wreckage at the bottom of Cwm Lloer’s Corner Gully, scrambled up the steep scar and stepped onto this crest (that which the unfortunate pilot failed to clear) only to see my companion lifted bodily into the boiling clouds by a wind that has gathered itself for two thousand miles. On that wild morning, we hit the ground like two sacks and crawled back over the edge. 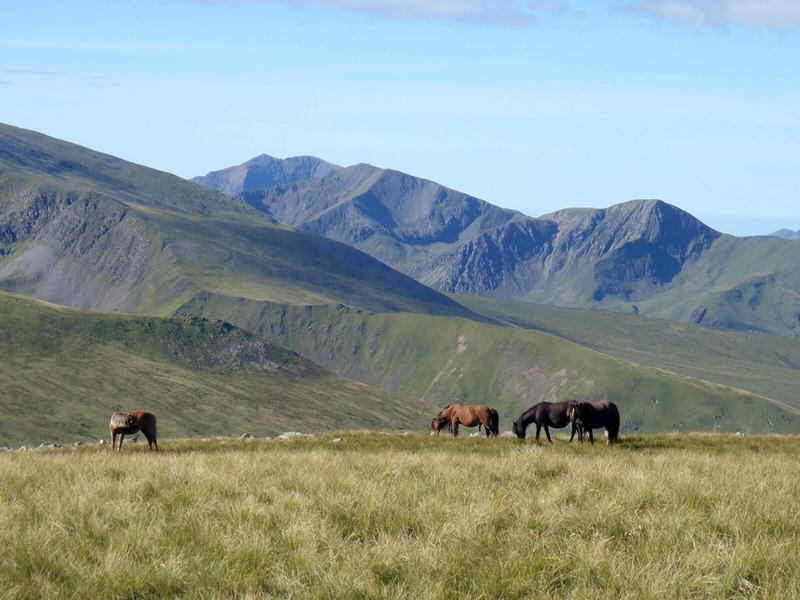 The Carneddau, for all their reputation as a gentler, rounded alternative to the fierce, rugged, plunging scapes of Yr Wyddfa and the Glyderau are magnificent – high and not to be trifled with. 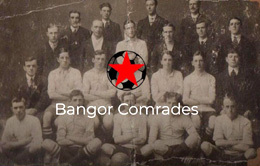 Their benign reputation is falsely earned. 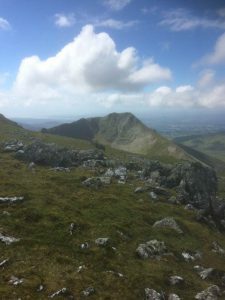 Cross Carnedd Dafydd – amongst my favourite places on the planet – and as you trip along the springy, coarse tufts of upland grass, edge your way to the brim of Ysgolion Duon or the Black Ladders as they are known. I challenge you not to shudder at the prospect of how long it would take to fall into the depths of Cwm Llafar. These cliffs are the stuff of quickening heart-rates. The ravens hereabouts exude confidence – they soar and croak their doom-laden harmonies, glad to be alive, waiting for the plunge and last bleat of a sheep that risked a ledge too far. 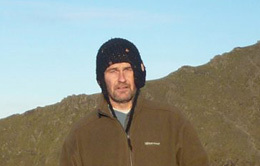 So now we have taken the crown of the first prince of the Carneddau. On another day, after this trek, drive from Bangor towards Bethesda and cross the roundabout by the Llandegai industrial estate. Do it on a fine evening and watch Carnedd Dafydd rear up between the trees. When the late sun picks out the stony summit, it takes every fibre of effort to look back at the road. Back on the edge of the Ladders, the going is unchallenging and a breeze will likely chase your steps towards Bwlch Cyfryw Drum, the rocky spine that separates the dark depths of Cwm Llafar from the gloom of Cwm Llugwy. Cross this airy bridge and there follows a four hundred foot zig zag to the highest point of the day. Carnedd Llywelyn is 75 feet lower than Yr Wyddfa and as a fortress, with no railway, no cafe and no number-obsessed hordes, might as well be a thousand feet higher. A pinnacle? A pointed steeple? No. This is a wilderness of monoliths and random, jagged, lichen-stained rock sentinels that guard time, unmoved by elemental furies. Get lost up here on a bad day and you could walk for a miles before discovering yourself back where you started… or at least somewhere that looks just like it. Let’s assume for now that you can stroll around with impunity. We used to plan camps by Ffynnon Llyfant, wonder if the gullies above Cwm Caseg would be within our winter compass or just sit and stare across at Dafydd and eye up Crib Lem. Elidir Fawr, seen into the sun from here, looks like a sharp peak, Afon Conwy becomes tidal, Darby and Joan eat sandwiches in their car on the Great Orme, the Isle of Man tantalises and the skylines of Wales layer themselves to eternity. The nearest man-made road is a long way away. There are no trains. Once, alone, some years after our teenage reconnaissance, I bivvied here in a brown Woolies sleeping bag (flasks and bags…) inside a big, orange plastic sack. The sun disappeared into a haze over Sir Fon and the midges showed no mercy, Sitting atop this stronghold on that magical evening, sucking on a can of cheap lager and eating chocolate, beat all the drugs I never took, into a cocked hat. The conquistadores who cannot resist the numbers and the right boxes ticked, might double down and back to Yr Elen but that joy deserves a different day and besides, if you must strike it from your list, look for the path that traverses Llywelyn’s flank, beyond Bwlch Cyfryw Drum and save yourself a slog. 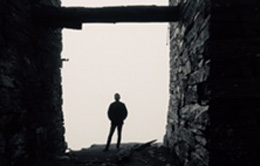 From here, everything changes and all is bleak, upland isolation. 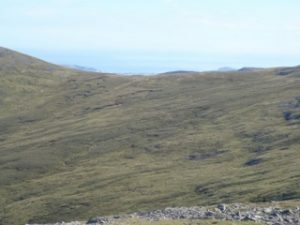 Another mile captures Foel Grach and its pointless refuge hut. Anyone benighted in the high Carneddau, in a white-out or flattening hurricane, would have as much chance of taking refuge in that dubious-smelling shed as they would finding a unicorn upon which to ride home. The sentiment behind its construction was admirable enough but let’s face it, unless you happen to be on that exact spot when the storm strikes, you’d be better off using your map and compass to lose height as quickly and safely as you can. Nearly forty years ago, we decided to camp there. We witnessed a fabulous sunset prior to an overnight deluge and heard the announcement of Bon Scott’s death on our transistor radio. If ever there was an ‘I remember where I was the day that…’ moment, that was it. From Foel Grach the options are many. 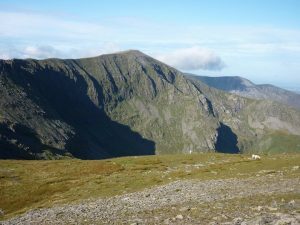 Wordsworth would probably wander across the almost featureless plateau to Foel Fras. 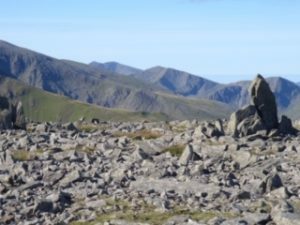 Had he been a poet of the digital age, his floatings would probably have been filmed from a helicopter, hovering above what we knew as Garnedd Uchaf but which is now the altogether more grandly titled, Carnedd Gwenllian. Oh and it’s a mountain now. It never was. I still have difficulty with the concept of the ‘fifteens’. To us, it was the ‘fourteens’ and probably always will be. There’s a wall on Foel Fras that becomes a fence. Follow both and you’ll cross Drum on your way to Aber or Llanfairfechan. If you wish, turn left at (or before) Gwenllian and follow the drover’s track towards Talybont and branch off to Gerlan over Gyrn Wigau . There will be no crowd and no queue. Wild ponies will watch you, unknown birds will break cover and take flight at your approach, breezes will hiss, the sky will be huge and you will be tired but whichever way you choose to make your way back to Bethesda or Bangor or Aber or Llanfair… or even Dolgarrog, you will have chased my daily waking dream. 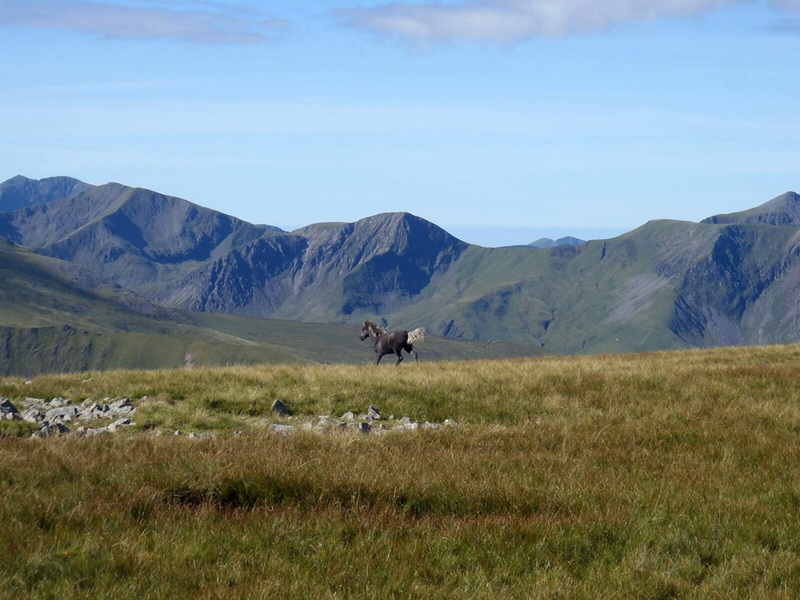 The realm of the Carneddau is the quintessential territory of ‘away from it all’. Try it. It will not disappoint.